Last week I attended a panel discussion titled "CLOs in the Heartland" hosted by Mayer Brown and Fitch Ratings, while most of content was directed at the structured finance industry (my day job), I found a few of the topics applicable to the broader value investing universe that I thought I'd share. For the uninitiated, Collateralized Loan Obligations (CLOs) are pools of leveraged loans that are then sliced (tranched) into different levels of risk and sold to institutional investors. Unlike the ABS CDOs that were ground zero of the 2007-2009 financial crisis, CLOs experience few defaults as they were genuinely diversified among many different industries and weren't forced to sell assets that had dropped in value. Contrastingly ABS CDOs ended up holding 100 securities that were virtually the same and all were impaired at the same time causing total losses in many deals up to the AAA tranche. A good example of the collateral held in a CLO is Tropicana Entertainment's term loan they recently closed in connection with the Lumiere purchase. 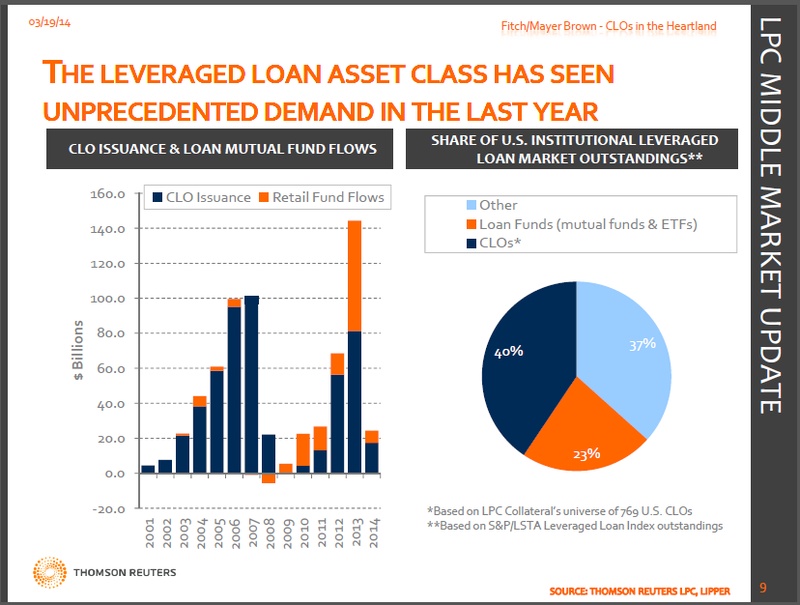 CLOs are typically actively managed for a period of time by an asset manager, and those managers have begun facing considerable competition for loans from retail floating rate mutual funds and ETFs. An interesting situation has the potential to play out in this space as a CLO represents essentially permanent capital for the manager for an extend period of time, during times of distress like 2007-2009, CLO managers were able to hold on to their assets and ride out the wave without investors demanding their money back. CLO investors could only obtain liquidity by selling their CLO liabilities/equity holdings in the second market. Whereas in a mutual fund or ETF, a manager would be forced to raise capital by liquidating their loan portfolio to meet redemption requests. Retail investors have been pouring money into floating rate or bank loan funds as a safe haven from interest rate risk, the below slide from the conference shows the dramatic flows that occurred in 2013. I would guess much of this happened after the spring when rates first began to start moving up. What happens when flows reverse themselves? Leveraged loans are not book entry securities and aren't completely liquid. Loans that trade hands on the secondary market can take 1-2 weeks to settle, and if they're distressed that time frame can stretch out into months. Retail investors are by nature hot money, and may pull their cash at the first sign of distress causing liquidity issues for the managers of leverage loan ETFs and mutual funds. This rush to exit and forced selling of supposedly liquid assets is what caused trouble in the money market fund sector, and could cause similar issues for bank loan funds. A fund's net asset value might not be what it appears in a quick liquidation. One panelist, Levoyd Robinson (fantastic panelist BTW) of Chicago Fundamental Investment Partners, pointed out the CLOs are essentially long volatility in the bank loan space. Because of their pseudo permanent capital funding structure they'll be in a position to take advantage of any volatility caused by the retail investor exiting the space. CLO equity (first loss position, 8-10x leveraged) targets internal rates of returns in the mid-teens, and his thinking is if volatility picks up, these returns would only increase over the full cycle as managers in CLO could pick off good credits from forced sellers. Where could individual investors potentially take advantage of this idea? Many BDCs hold CLO equity, but I'm not a huge fan of those as I think they're primarily built for the benefit of the third party manager. But there is one BDC-like investment company that invests almost completely in CLO equity and a little bit in the junior/mezzanine tranches, Oxford Lane Capital (OXFC). While I haven't done a lot of work on Oxford Lane, a few things do jump out at me, they have been ramping up their equity base and buying a lot of the recent CLO issuances. Is this because CLOs are a great deal now? Eh, more likely the 3rd party management agreement that encourages asset growth over total returns. But it is a pure play on CLO equity, and will likely perform better in a rising rate environment than the mortgage REITs. The growth of BDCs and its potential issues is another area that concerns me and might be ripe for distressed investing situations in the future. Their growth as been pretty incredible as retail investors continue to scoop up anything with a high yield, never mind the fact that they're taking incredible amounts of risk to secure that yield when they could take fractions of the risk for the same return if they had a total return mentality. 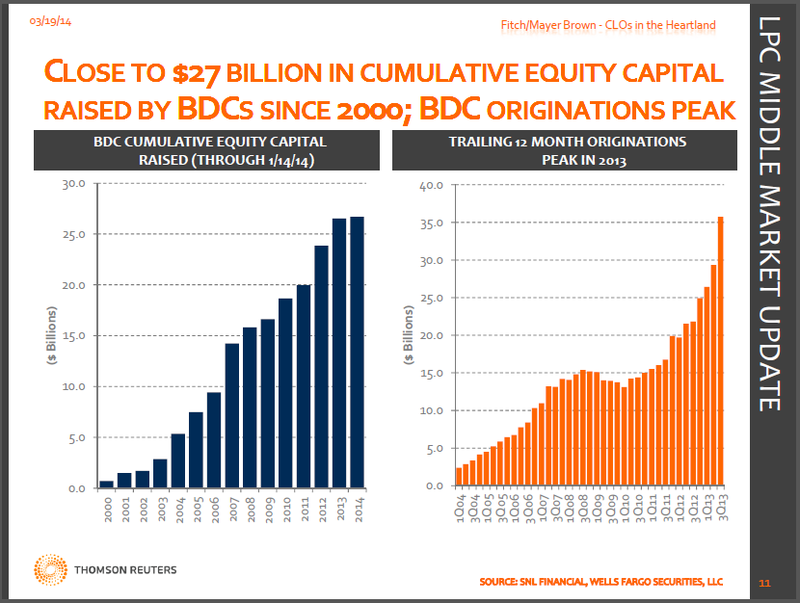 One hallmark of BDCs has been their limit on leverage to one times equity, however there's talk of that increasing to two times leverage by the end of the year. Politicians are putting this forward as a way to increase lending to small businesses, but the fact remains that most of the loans that end up in BDCs are not to small businesses or venture capital like startups, they're the same stuff that finds their way into CLOs. Continued low interest rates and competition for leveraged loans is making it more and more difficult for managers to grow their distributions, so one way to make that problem go away is more leverage. Expect a few blow ups in this sector during the next recession. I will be attending the 9th Annual Credit, Restructuring, Distressed Investing & Turnaround Conference next Friday (4/4) in Chicago, and would enjoy meeting up with any readers who are also attending, so if you are attending please send me a note. I doubt there are many attractive active distressed ideas out there currently, but it will be interesting to hear the panelist comments and hopefully come away with a few areas of interest to watch for as the business cycle unfolds. So I was browsing around for new ideas when I stumbled across a post by Olmsted at the Corner of Berkshire & Fairfax message board who compared a new name to me, Municipal Mortgage & Equity ("MuniMae"), to blog favorite Gramercy Property Trust. And after reading through quite a few complicated balance sheets, I can agree the parallels are definitely there. Before the credit crisis, MuniMae originated and managed debt and equity investments collateralized by affordable housing that offered attractive tax incentives. Things went very wrong for the company in 2007 when the market for tax-exempt debt securities sharply declined forcing the company to meet all sorts of collateral calls by selling their assets at distressed prices just to stay alive. The situation was compounded by some accounting issues and their accountant's assessment that there was significant doubt they could continue as a going concern. Fast forward a few years and the company has sold off most of their assets and derisked their balance sheet, the most recent example being the sale of a huge bond portfolio, "MuniMae TE Bond Subsidiary LLC" or TEB, to an affiliate of Bank of America Merrill Lynch. As part of the sale, they were able to shed much of their short term floating rate debt that was financing the long term fixed rate bonds which was presenting the company with interest rate risk scenarios where a small increase in rates could effectively wipe out the equity. Another key aspect of the TEB sale is it allows the company to convert from a partnership to a corporation for tax purposes. As a partnership, the company was forced to pay a lot of phantom gains out to shareholders due to the company repurchasing their own debt at a discount. Now going forward, they'll be able to utilize their huge NOLs and essentially never pay income tax again. So the bond portfolio that remains is now only 55% leveraged and much of it is non-performing, so the risk of the company switches from mostly interest rate risk to underlying asset performance risk. The TEB sale also will dramatically reduce the net interest income spread they receive, putting pressure on the company to either cut operating expenses or find a new profitable venture. The cash and restricted cash portion of the balance sheet is pretty straight forward, the restricted cash is mostly collateral held in total return swaps that will expire in the next year or two. $45MM in free cash is a nice position to be in when they have a share repurchase plan in place to buy up to 4 million shares at the book value per share as of the last quarterly, or $1.22 currently. That's a nice floor under the current market price, and management and the company have been recently purchasing shares at higher levels. (2) Represents the carrying basis of the bonds eliminated in consolidation. This amount excludes net unrealized gains occurring since consolidation that have not been reflected in the Company’s common shareholders’ equity given that the Company is required to consolidate and account for the real estate, which prohibits an increase in value from its original cost basis until the real estate is sold ($32.5 million at September 30, 2013 and $10.7 million at December 31, 2012). So the fair value of the bonds is closer to $321.4 million dollars, a $32.5 million increase is a big adjustment for a ~$50 million market cap. The big question then... are the marks correct? Well during Q3 2013, MuniMae foreclosed on and sold the underlying real estate on two bonds in their portfolio for virtually the same amount as the fair value of the bonds. Small sample size, but it provides a little reassurance that the fair values are reasonable. REO assets: They have a few parcels of undeveloped land and a multi-family property that they've foreclosed on in the past that they're holding as real estate held-for-use. On a few recent conference calls these have been discussed as potentially having value a few years down the line, and that they were valued at 7-10x their current book value at the time the original bonds were issued. Solar assets: There are some leftover solar assets from a failed business purchase just before the credit crisis, value here is probably minimal. Some potential GP incentive income from the LIHTC Funds that could materialize, but not for several more years. International Housing Solutions (IHS): 83% stake in a South African asset manager that has one private equity fund which invests in affordable housing in South Africa. MuniMae's equity stake in the one private equity fund shows up on the balance sheet, but not the ownership stake in the asset manager doesn't. IHS is looking to raise capital for another fund and MuniMae might use some of their free cash to invest here. 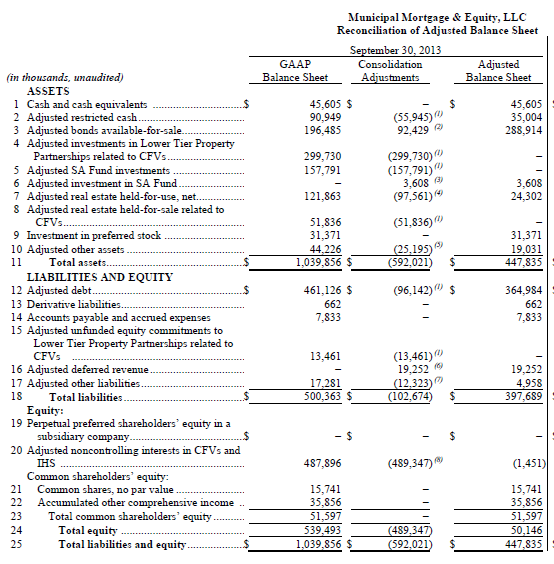 If you assume the rest of the balance sheet is properly marked, the adjusted book value per share of MuniMae is closer to $2.00/share (currently $1.25), with a lot of management optionality in how they deploy their free cash (more stock and debt repurchases), manage the remaining bond portfolio, and any upside from the REO and LIHTC assets. The obvious risks here are (1) the bond portfolio loses value and (2) this has been a historically mismanaged company with the same management still in place. As for the bond portfolio, it's mostly unleveraged at this point, removing most of the dangerous impact from rising short term rates, and the bonds are collateralized by affordable apartments. There's lots of talk about the disappearing middle class and people falling behind, tax advantage affordable housing will probably play a role in addressing the problem. As for management, in reading their filings and conference call transcripts, they strike me as very transparent and fully acknowledging their past mistakes. They even let individual investors ask questions! So I agree that MuniMae could be a good place for people who have taken gains in Gramercy and looking to roll that money into a similar theme. I've added a smallish position to my portfolio. This one might be a little controversial, but I think it deserves a second look... the St. Joe Company has been in the news quite a bit the last few months with two large asset sales, one of their timberland assets, and the sale of their RiverTown community in Jacksonville. I found both transactions pretty interesting as it begins to show the company's future direction and potential value. With the recent transactions, I think St. Joe has the opportunity to follow a similar path as the Howard Hughes Company by selling acreage in their residential communities to home builders and eventually redeploying that capital into income producing industrial and commercial assets. Post spinoff, Howard Hughes was much farther along than St. Joe is currently in the process, but I admire St. Joe's Chairman Bruce Berkowitz (manager of the Fairholme Fund) and there's no doubt he has seen friend Bill Ackman's playbook and will move to implement a similar strategy creating value at St. Joe. The St. Joe Company was formed by Alfred du Pont and his brother-in-law Ed Ball in the early 1930s to hold a collection of assets they purchased in the early days of the Great Depression. Included in St. Joe at the time was a sugar company, an interest in Florida National Bank, cardboard box plants, an interest in the Florida East Coast Railway Company and vast swaths of northwest Florida land. St. Joe was rather conservatively managed for decades as primarily a timber and paper business until 1997 when they brought in Peter Rummell as CEO. Rummell was a real estate developer, with previous stints at Avrida and the Disney Development Company before joining St. Joe. Rummell took to St. Joe's real estate assets and repositioned the company as an upscale developer. St. Joe's fortunes boomed and busted with the Florida real estate market in the mid 2000s. One savy move management made during this period was to raise $570 million in equity during 2008, otherwise it might not have survived the financial crisis. As a result, today the company has very little debt and plenty of balance sheet flexibility. Fast forward a couple of years and St. Joe had basically shut down its operations as the real estate crash brought its business to a halt. Despite being near ground zero of the crisis, St. Joe was slow to take material write-downs of its real estate assets. This caught the attention of hedge fund manager David Einhorn and in October 2010 he presented a very detailed, well thought out short thesis on St. Joe (a must read if you're considering investing). He also argued that after all the money and effort, St. Joe made very little money in the development of real estate and should be valued at roughly the value of their rural forestry land, or about $1,500 per acre. Since David Einhorn's presentation, much has changed at St. Joe. In March 2011, Bruce Berkowitz took control of the company becoming Chairman and brought in Park Brady (formerly of Leucadia National), eventually elevating him to CEO. After Berkowitz came aboard, St. Joe took a large write down on the improvements and capital expenditures previous management made to their real estate of $375 million. Much of these write downs were on the same properties Einhorn went into such great detail examining. On November 7th, St. Joe sold 382,834 acres of its "non-strategic" timberland and rural land to AgReserves for $565 million, or for $1,475 an acre (which gave the appearance of a victory for the short thesis). This sale represents substantially all of St. Joe's forestry land, so they'll be out of this commodity business once the deal closes. The tricky part of the transaction will be structuring it to be as tax efficient as possible; the land has a cost basis of $54 million, creating a large taxable exposure. St. Joe does have $76.8 million in Federal net operating loss carryforwards that will be exhausted after the sale, they're also exploring a combination of cash and timber notes that could reduce their tax liability. On December 31st, St. Joe entered into an agreement to sell their RiverTown community to Mattamy Homes for $43.6 million, with an additional $20-$26 million coming at the end of 5 years associated with impact fees. RiverTown is a community located outside of Jacksonville and was deemed as non-core to St. Joe's strategy of concentrating their time in Northwest Florida. The net carrying amount of RiverTown was $16.7 million on the balance sheet, so there will be a small tax impact here as well. I believe the more important transaction of the two is the RiverTown sale despite the smaller scale, this transaction received considerably less press coverage but is more telling of the potential value hidden in St. Joe. RiverTown was one of David Einhorn's "ghost towns" that he prescribed very little value to, however this transaction works out to a sale price of roughly $10k per acre. What other assets have recovered in a similar fashion? After both sales, St. Joe will have roughly 180,000 acres concentrated in northwest Florida. St. Joe has communities with very inspirational names like WaterSound Beach, Windmark Beach, and Rivercamps targeting both the baby boomer retirement market (will newly surging 401k accounts encourage baby boomers to splurge?) and second home buyers located in nearby southeastern states. St. Joe has stated they intend to invest capital in these residential communities going forward and potentially building out a Villages like active adult community (with additional retail and commercial buildings). I would prefer they invest in commercial and industrial properties (like they have built for Exelis), but the residential base isn't there yet to build commercial properties in scale, they need more residents to support it. There is some potential for commercial properties that could generate meaningful operating income. 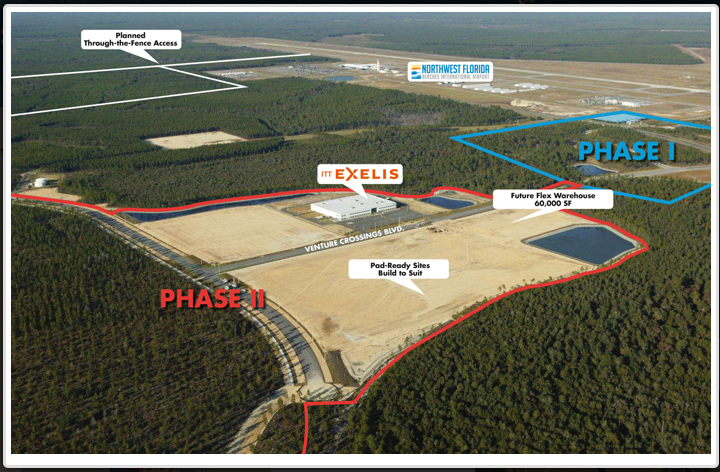 St. Joe donated land to build the Northwest Florida Beaches International Airport, which opened in 2010 and hasn't been a tremendous success. A quick Google Map of the surrounding area shows minimal development, but this is where the value in St. Joe's is; long term operating income producing properties. Southwest Airlines is the main carrier with Delta also running a few flights back and forth to Atlanta, but this is a pretty empty airport at the moment. Again, the area needs more residents before the more flights are added, additional carriers are added, and the eventual gain in property values in the surrounding area. There's also the Port of Port of St. Joe, which with some additional investment could be the closest port to the renovated Panama Canal, and the Pier Park North project is another nice retail project to add recurring income to the St. Joe portfolio. After the two asset sales close, St. Joe will be left with a lot of cash, but a pretty restrictive investment policy of 50% in cash and the rest mostly in government securities with a small bucket of corporate debt (which is in Sears and JC Penney). Ideally, Berkowitz would have free reign allocating capital wherever he sees the best value, but St. Joe wants to avoid the burden of becoming an Investment Company. With the recent asset sales, St. Joe now has approximately $700 million per share in excess cash (this is a guess, tax consequences for the asset sales is a little hazy) for Berkowitz to allocate. Previous management was criticized for spending money on development with very little ROI, but I would imagine that will change considerably going forward with an investment focused Chairman and his hand picked management team. That's really the crux of a long thesis in St. Joe, faith in management to no longer waste shareholder funds on low return opportunities. If the RiverTown assets were worth ~$10k an acre, and it was a legacy bust asset, how much is the remaining core real estate worth? Yes, there's a lot of rural land surrounding the airport and other non-entitled land, but I believe the current market price provides a reasonable margin of safety with the opportunity to invest alongside a great investor. St. Joe's land is highly concentrated in Northwest Florida, their fortunes will be tied directly to the development of the area, which historically has had little economic development and below average income growth. "Lower Alabama" or "Redneck Riviera". St. Joe's land is located in rural areas of Florida, the development time frame is long and will likely require a lot of capital. High short interest, David Einhorn took a victory lap of sorts with the media after the AgReserves sale appeared to justify his per acre valuation of St. Joe, he remains short and more media coverage regarding his short could move the market price down in the short term. A lot of my thesis revolves around Bruce Berkowitz being the Chairman and his asset allocation abilities, however his position in St. Joe is quite small for his fund and he likely doesn't devout much of his time to St. Joe given his competing interests (including starting up a hedge fund). Overall, I see some loose parallels to Howard Hughes Corporation, although I think St. Joe's assets are farther out from being realized, its going to be a slower transformation. Bill Ackman and Bruce Berkowitz are similar investors (Bruce was also an initial investor in HHC, but he has since sold his position); Ackman tends to be more of a pure activist, but both are willing to hold positions in the face of adversity and are concentrated long term holders of high conviction investments. Disclosure: No position, but like New Media, strongly considering.